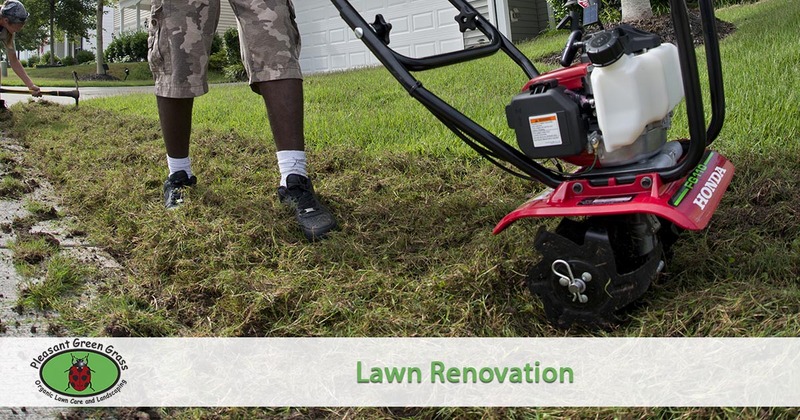 Has your lawn gotten so bad it needs an overhaul? Pleasant Green Grass offers an affordable lawn renovation service that will have your lawn looking great in just a few weeks. We provide services in Apex, Cary, Carrboro, Chapel Hill, Durham, Hillsborough, Morrisville and the West Raleigh area. We till under the existing vegetation and soil with a roto-tiller, then we rake out the unwanted plant debris. Next we spread a thick layer of compost over the entire lawn area. Then we till that compost into the soil. This mixes the compost into the existing native soil adding literally tons of much needed organic matter. Then we smooth out the surface and spread seed. Next we cover the seed with a biodegradable matting to protect it. Lastly we roll the entire area with a sod roller. This presses the seed down into the soil. Good seed to soil contact is the secret to fast seed germination. The matting will help protect the seed from birds and washout from heavy rainfall. It will also help conserve moisture which helps with germination. . If you don’t have an irrigation system we will set up a temporary one for you with timers and multiple sprinkler heads so all you have to do it watch your new grass come up. Request your free quote by calling 919-357-8245 or filling out our online quote request form. We will get a quote to your quickly and schedule your service right away.